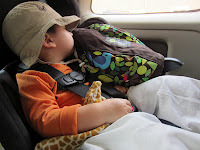 On our recent visit to Dubai and 12-day cruise to India, I hummed and hawed for weeks about whether or not to take our own car seat with us. In the end, I decided against taking our own car seat. With my backpack, a small travel purse, and our awesome Heys rolling suitcase, that left me with one hand free to push B's stroller (or folding up the stroller and carrying on my shoulder, a hand free to hold his). This worked perfectly for getting through the airport and through security, but a little voice in the back of my head kept asking if I had made the right decision. A few weeks prior to our trip, I arranged a car seat rental from Rentacrib, a Dubai-based baby gear rental company. In addition to being a safety essential, car seats are required in all vehicles (except taxis) by law for all children under 6 years of age, so I knew it was important to have a car seat for each ride on our journey. In addition to our travels within Dubai, we would also need a car seat for cruise stops, so I arranged the rental for the entire duration of the holiday. Unlike a number of things on this trip which did NOT go to plan, I was thrilled to arrive in Dubai to find a representative from our hotel (The Qamardeen) waiting for us with the hotel shuttle - and even better still, with our rental car seat installed and ready to go! Realizing the hotel's own car seat might be too small for a toddler, The Qamardeen's clever concierge brought along our rented car seat (which had been delivered as scheduled to the hotel that morning) installed and ready to go in the shuttle. Hurray! The car seat provided was a light-weight Safety 1st brand seat in pristeen condition, and fully equipped with the LATCH system and belt clip for securing with a seat belt. The lightness of the model was a blessing throughout the trip, as I needed to carry it on and off the cruise ship at each port (often with one arm, and B in the other after a long, tiring day out and about). Through the course of our travels, I didn't encounter a single vehicle with LATCH anchors, so in each case, I secured the seat using the seat belt and belt clip. At the end of the cruise, B and I spent four nights at the Sofitel Jumeirah Beach Walk, and Rentacrib had no problem picking up the car seat from a different location at the end of our holiday. The rental for 17 days ended up being approximately $75 CDN (including delivery and pick up! ), far less than it would cost to purchase a seat locally, and far less than it would cost for me to replace our own car seat had it been damaged in transit. Rentacrib is based out of Dubai and serves the Dubai and Abu Dhabi areas. They offer rentals of car seats, booster seats, travel cots and strollers, plus safety items such as baby gates and monitors. I highly recommend them! A very good post ,I like it very much ,hope you will give another post asap Great info Thanks! I really enjoy reading your blog and I will definitely bookmark it! im so glad I came across this post.....super helpful! http://hire4baby.com is also one line rentacrib providing quality baby equipment on rent in UAE. hire4baby is charging less. Great idea to rent a car seat in Dubai! I am really pleased to read it and I have to try it when I will go there. It is such an amazing effort. Thank you so much and visit here to know more about car seat. Thank you for this full package of travel with babies.